Script file containing all necessary settings required for correct working of Graphical Installer powered installer. It is an addition to file called <project>.iss which is a main installer file. Several projects can share the same <project>.graphics.iss file use it to create multiple installers with the same design. All Graphical Installer powered installers MUST contain both files (also they must be in the same directory). If this or <project>.iss is missing, the installer will not be skinned properly! This identifier is generated automatically and tells the compiler to compile <project>.iss file and <project>.graphics.iss as Graphical Installer project. If this symbol is deleted (or commented out) the installer design will switch from 'skinned' to 'classical' look. Use this symbol to turn OFF drawing skinned buttons. Instead VCL skinning is used. Define it only if Graphical Installer is used together with VCL Styles for Inno Setup plug-in! 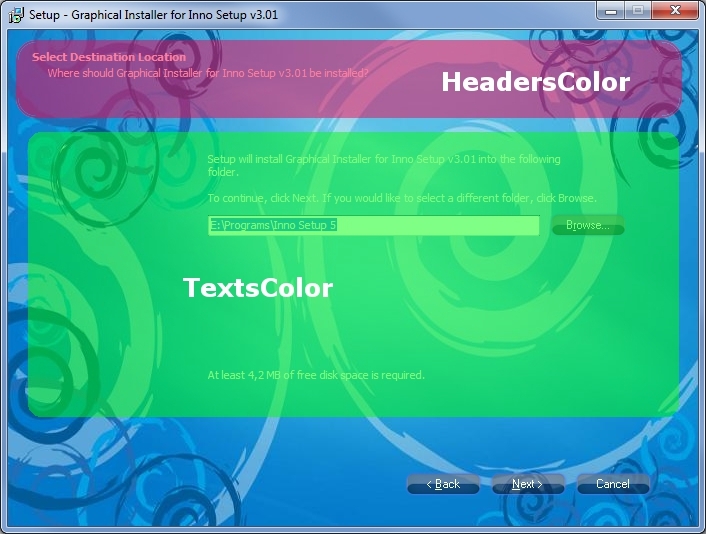 Color of all header texts in installer. Headers are usually at the top of each page in installer.. This color is used for TNewCheckListBox component - when some item is selected. See the next picture to determine where each color is applied to. This image is generated via BitmapCutter.exe tool automatically from Graphical Installer Wizard. - 4 button states inside of it: "normal" (orange area), "focused" (blue area), "pressed" (green area) and "disabled" (yellow area). - Size of each button state (orange, blue, green or yellow area in the left part of above picture) is 80 (width) x 34 (height) pixels. - Space [colored area around each button state] is used for better positioning of final button and it is not shown in final installer! - Only effective area of button is shown [80 x 22 pixels] - as you can see on the right side of above image. Button images should not have any text written on them. Text is loaded dynamically from Inno Setup language file! Do not fill area around button states with color as we did. We did it only for better imagination of button states. PNG images support transparency. Use advanced graphic programs like Gimp to edit PNG images. Color of all button texts in installer. This color is applied to all buttons when button is in regular state. Color of all button texts in installer. This color is when button is focused. Color of all button texts in installer. This color is applied when button is pressed down. Color of all button texts in installer. This color is applied when button is disabled.